Capt. 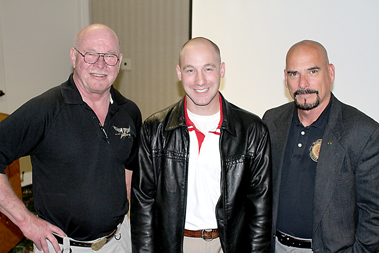 Anthony Mench, left, helped coordinate a recent training workshop attended by Highspire Patrolman Jimmy Brown, center, and led by Lt. William Collins, right. Highspire Patrolman Jimmy Brown wants to be a great police officer. He was one of 30 officers from departments in Pennsylvania, New York, and West Virginia who attended a two-day seminar in Swatara Twp. that focused on investigative techniques. Highspire, Middletown, and Steelton police departments all sent officers to the training sessions. “It is a very informative class,” Brown said on Thursday. The class, Basic Criminal Investigations for Street Patrol and New Criminal Investigators, was taught by Lt. William Collins, a retired officer and detective with more than 30 years of experience working on tough cases. The seminar was held at the Best Western Inn & Suites on Eisenhower Blvd. on May 17,18 and 19. The Public Agency Training Council, a nationally recognized police training organization, organized the seminar, which was sponsored by the Highspire Police Department. The class trained officers on collecting evidence, controlling crime scenes, dealing with interviews, and conducting interrogations. When collecting evidence, Collins said, it’s important for police officers to follow legal procedures so, when presented to a judge, the evidence isn’t thrown out. The hardest cases are those involving children, said Collins. “The more experienced you get, the more objective you can be and get the bad guy. Then maybe go to the funeral and get closure, realizing that this is a human being,” he said. Coordinator for the seminar, Capt. Anthony Mench, commended the Highspire Police Department for holding the seminar. “They are interjecting a huge amount of professionalism into their police department,” Mench said.